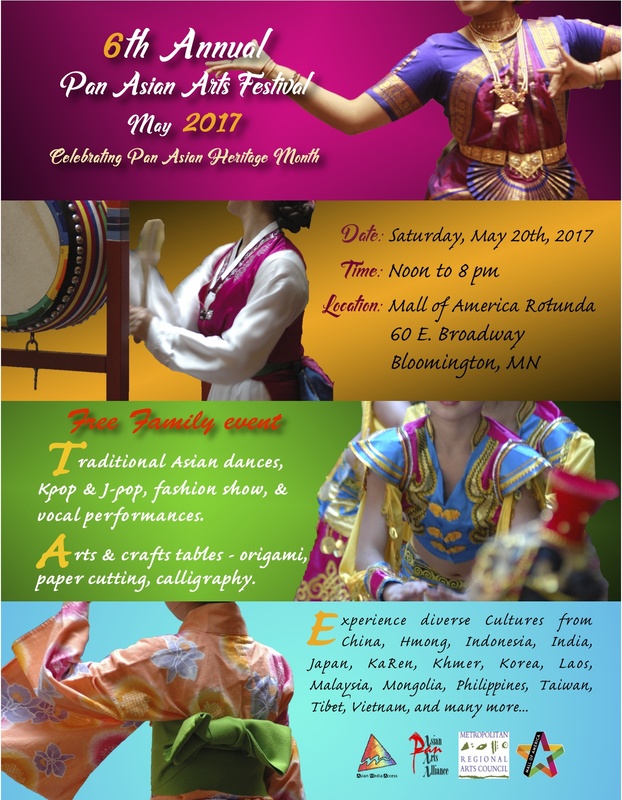 The 8th Annual Pan Asian Arts Festival returns to the Mall of America on Saturday, May 4th from 11 AM to 8 PM. The event is open and free to the public. The year, we will focus specially on the Southeast Asian region, to celebrate their New Year with dances, music, fashions, and other demonstrations showcasing the local Southeast and oversea Southeast Asian talents. Our oversea performers come from the Xijiang Miao/Hmong Village Performance Troupe. The estimated 9.4 million Miao/Hmong people in China mainly live in Guizhou, Hunan, Yunnan and Sichuan provinces. This prestigious Performance Team is from the largest Miao/Hmong community of Leishan County in Southwest China’s Guizhou Province. The Performance Team is listed as a national-level historic cultural performance, and in 2011, it was selected as an AA-level tourist destination by the national government. Come out and enjoy a day of dances, music, singing, from all regions of Asia, performed by local talents of the Twin Cities. If you would like to share your talent to perform, please do so by signing up at bit.ly/PAAF2019Register. Also follow us on our Facebook Page for the latest. 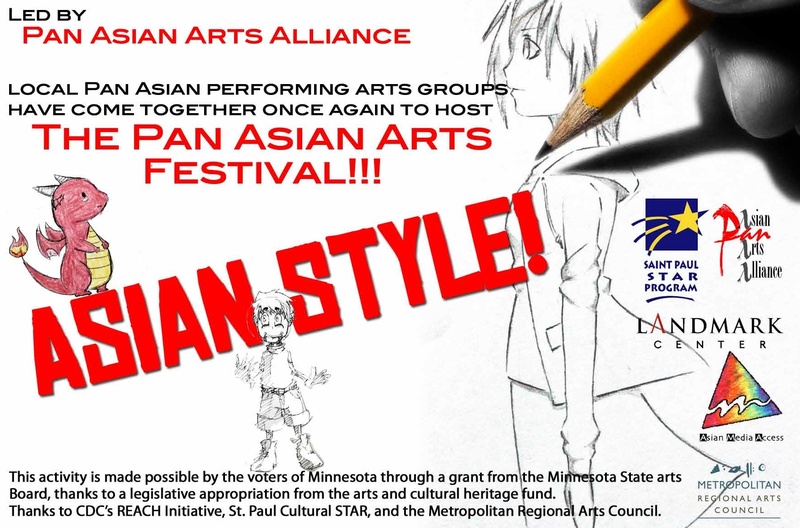 This event is sponsored by Pan Asian Arts Alliance, Asian Media Access, and the Mall of America. This activity is made possible by the voters of Minnesota through a grant from the Metropolitan Regional Arts Council, thanks to a legislative appropriation from the arts and cultural heritage fund. After months of planning, preparations, and countless hours of rehearsals and practices, Generation Z Projected debuted on the stage of the Ordway Theater in downtown St. Paul. Cosponsored by Pan Asian Arts Alliance and Asian Media Access, the event showcased the talents of young people 30 years old and younger. They brought with them to this variety show urban, hip hop, and modern dances and vocal performances, a fashion show featuring a young designer, and a very energetic, upbeat, and noisy lion dance routine! The show program booklet you can download gives introductions to each group or individual performers that participated at the show. In celebrating the Asian Heritage Month of May, 2018, Pan Asian Arts Alliance in partnership with Asian Media Access present the 7th Annual Pan Asian Arts Festival. The festival will be held at the Mall of America Rotunda area on May 19, from 11 AM to 8 PM. 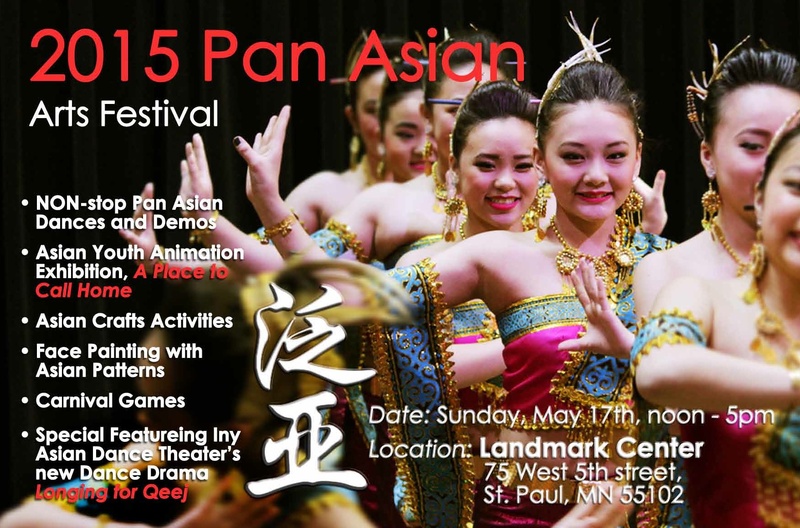 Come join us for a day of dance and singing performances, fashion display, and other talent showcasing the Twin Cities’s Asian communities representing all different regions of Asia. The event is free and open to the public! Come and share the beauty and joy of the performing arts. If you would like to perform at the festival, see more information, and fill out the application form found here.